Thinking about your post-work home? You'll get huge bang for your buck -- plus lots of other perks -- in these towns. What happens in Las Vegas stays in Las Vegas, and that's fine with residents of this gambling-free town (a rarity in Nevada), who get all the benefits of living 20 miles from Sin City without having to constantly contend with the tourist set. Federal workers build Boulder City in the 1930s to house workers constructing the Hoover Dam just six miles away. The dam remains a major tourist attraction, and it created boat-friendly Lake Mead. In the summer, the thermometer regularly cracks three digits, but Boulder City residents get outside anyway. 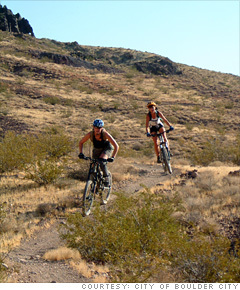 Local Bootleg Canyon offers a range of hiking and mountain biking trails, and a new zip line for the extra adventurous. The city has a variety of public recreation facilities, including two golf courses and a year-round pool and racquetball complex. Boulder City plays host to a range of community festivals each year, including the Best Dam Barbecue cook-off in May, the Fourth of July Jamboree Parade and Celebration and the Boulder City Fine Arts Festival in October. --B.B.